Are you reading The Geography of Madness with your book group? Check out our reading group guide to get the conversation started. 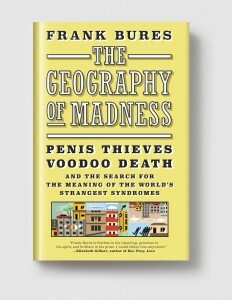 FRANK BURES’s stories have appeared in Harper’s, Esquire, Outside, Bicycling, Wired and have been included in a number of Best American Travel Writing anthologies. They’ve also been selected as “Notable” picks for Best American Sports Writing 2012 and the Best American Essays 2013. He speaks several languages, has lived in countries around the world, and currently lives in Minneapolis.